Lesley Henderson and Simon Carter: What can we learn from the doctors of Star Trek in its 50th anniversary year? You don’t need to be a “Trekkie” to have noticed that 2016 marks the 50th anniversary of Star Trek. Events around the world have been organised to celebrate the enduring success of this popular TV and film series. We think that doctors should be particularly interested in Star Trek, not least because doctors have always featured prominently in every reincarnation of the franchise. Indeed, the President of the American Medical Association, Dr Robert Wah, named Star Trek’s iconic physician Leonard “Bones” McCoy as his favourite fictional character because he represents the perfect combination of scientific knowledge and human compassion. But what else can we learn from Star Trek? In a recent paper we published in BMJ Medical Humanities, we suggested that doctors in space embody societal anxieties about the future of medicine, health technologies, and healthcare. Science fiction stories often use settings in the near or distant future, which allows us to question the present by speculating about the future. 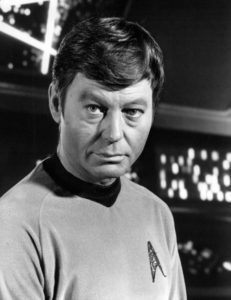 In Star Trek: The Original Series, first shown in 1966, Dr McCoy presents audiences with a figure that is both traditional and progressive—he refers to himself as a “simple country doctor.” He holds some distinctly pre-modern beliefs about natura medica and the natural healing powers of the body, while being comfortable with 23rd century medical technology. He has numerous gadgets at his disposal in his futuristic clinic, including the medical tricorder, a non-invasive medical scanner. While McCoy almost always starts his diagnosis by using his tricorder, he also uses a far more traditional diagnostic technique—that of palpation, the method of feeling with fingers and hands during a physical examination. This incarnation of Dr McCoy was on television screens at a time of change in medicine. In the post Second World War era, questions about the funding of medicine were constantly being posed, while at the same time medicine was increasingly relying on new technologies and diagnostic procedures. The cost of healthcare to the patient was dramatically increasing. McCoy represents the doctor that we would all love to have at our bedside, but he is saved from awkward questions about funding as he operates in a future “utopia” where money no longer exists. McCoy never needs to engage with tricky questions about rationing of treatments or ethical dilemmas about eligibility for medical interventions. His nostalgic presence reassures the audience that medicine’s future still has a space for the simple country doctor. Star Trek has also reflected concerns about gender equality and the role of female physicians. Dr Beverley Crusher, the chief medical officer in Star Trek: The Next Generation, filmed during the late 1980s and early 90s, was the embodiment of a heroic female role model and there is evidence that female medical students looked to this pioneering character for inspiration. Dr Crusher not only led a medical team—she was part of the senior management of the Enterprise—she was a single mother, a close confidante of the ship’s captain, and on occasion commanded the ship. Her introduction to the show came at a time when the absence of women in media was being challenged, and shows how the programme managed to map the changing patterns of gender in the medical workforce while challenging audiences’ views of the typical doctor. Later Star Trek doctors continued to tap into concerns about medicine. We see this most clearly with the alien Doctor Phlox from Star Trek: Enterprise, filmed during the early noughties. Phlox is part of an “Interspecies Medical Exchange” and maintains a menagerie of plants and animals in the sick bay, which he uses to prepare therapies to complement his traditional pharmaceuticals. In the early 2000s, Phlox could be said to embody the increasingly global nature of the medical workforce. He draws on alternative healing methods, is an advocate of a species spanning approach to healthcare, a champion of diversity, and has progressive attitudes on sexuality. Dr Phlox also reflects rising disapproval of impersonal medical technologies and care during this period. This theme of the “doctor as different” was also dealt with in Star Trek: Voyager, produced from the mid 1990s, in which an artificial intelligence doctor is “made human” by holographic routines, which give his sophisticated digital health software a male form. This doctor is frequently used for comic effect (he is arrogant and complains about his working conditions), but also forces us to reflect on “intelligent medical devices.” His presence captures growing debate about the role of digital healthcare and how new technology may have implications for the deskilling of medical practice. Despite the advanced medical gadgetry available to these futuristic medics, the role of doctors in Star Trek continues to be the reassuring figure of a family general practitioner, who is firmly embedded in their community and who acts as a confidante and adviser. McCoy and the doctors that follow him are more than representations of possible futures. They speak to many patients’ nostalgia for this fantasy doctor, at ease with increasing use of technology in medicine, but capable of understanding the human condition and the psychosocial fallout we all experience when facing ill health. 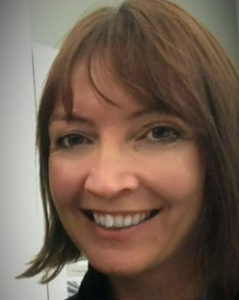 Lesley Henderson is senior lecturer in sociology and communications at Brunel University London. 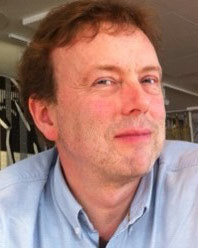 Simon Carter is senior lecturer in medical sociology at the Open University.